As I walked through the cavernous Milsco Manufacturing plant on the north side, I contemplated the size of the cows whose hides lay on rows of shelves in front of me. Freshly tanned and imprinted with a range of patterns, hides are the artist’s canvas of the leather product industry. Everything from “vascular” to “pigskin” imprinted leather. For Steven LeMaster, procurement engineer for the company, it’s a good thing we like our leather in all shapes and styles. Milsco makes leather seats, saddlebags, and (Hog Heads will appreciate) is the exclusive contractor for specific styles of saddle seats for Harley Davidson bikes. But our increasingly style-specific fetishes also result in a lot of waste. When LeMaster saw how much was being thrown away in his new job, he decided to do something about it. Milsco generates one 18-wheeler truckload of scrap leather waste a week, or 30% of its original leather. So LeMaster sought after and procured a market for leather scraps with manufacturers of belts and accessory items. “I don’t know what the management was doing before I got here, but I just couldn’t feel right sending that much good material to the landfill. We’ve got to look out for our environment or there will be nothing left,” said LeMaster. “The leather we buy is top quality; four dollars per square foot,” he points out. When you’re sending a truckload of it to the dump every week, anyone can see an obvious loss. LeMaster is able to sell the scraps for five to ten cents per square foot, a small fraction of the original leather’s cost. But selling the scraps is more profitable than paying a $300 haul fee to the landfill three times per week. Milsco’s business has increased 10% per year for several years, at least in some part due to the cost reduction in leather waste. LeMaster also donates some of the leather scraps to a Veterans help organization. One of the products made by this organization is a pen kit, in which a “thank-you” postcard is included. LeMaster receives over 100 of these postcards each week from Veterans who are exceptionally grateful for their gift from this unknown company in Milwaukee. One woman sent some of her pen drawings, which look like they were done by a professional artist and belong in a museum. Fifty percent of the leather LeMaster buys is from Riverwest’s own tannery on Meineke, right next to the soon-to-be Beerline Trail. Fritz Seidel, president of the Seidel Tannery, says the company uses natural tannins and low volatile organic carbon (VOC) solvents as much as possible, making his operation as environmentally sound as it can be. At a time when much of America seems to be on a runaway train toward increasingly excessive consumption and waste generation, it’s refreshing to see a business taking the initiative to reduce waste. 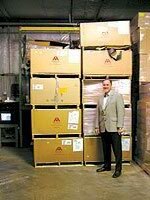 Milsco’s ability to generate a profit through waste reduction suggests that other businesses might want to follow in the footsteps of this Milwaukee leader.